“We need to protect the children”. We have stricter movie ratings, tv show ratings, video game ratings, and explicit music warning labels. So what happens when all of these fail? What happens even before these fail? Society corrupts the children; the educational system fails children; the welfare system fails children. These days everything and anything are blamed when children get hurt or end up in trouble (watched any version of Law & Order lately? )—except for children and the parents. 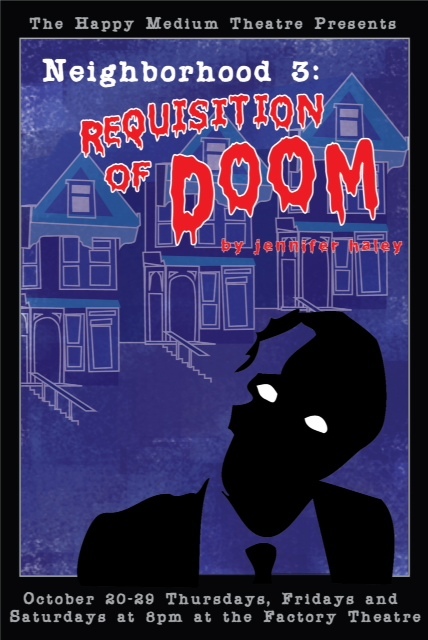 Neighborhood 3: Requisition of Doom gives the avatars (performers) a chance to escape from problems while the game gives the players (the audience) no escape. As the play progresses, it becomes clear that most of the parents are not available for their children either physically, emotionally, or both. E. Abigail Matzeder plays Barbara, a parent who actually begins to recognize, albeit too late, the real danger that lurks behind the trimmed hedges and the video game addiction. She and all of the parents are archetypal “soccer moms” and strict corporate dads. They all have skeletons in their closets (or their yards) that preoccupy their time and energy. The teenagers of the play feel that they have nowhere to go to express their fear and frustration, so they go to the game. The teenagers go from level to level killing zombies with the goal of reaching the final house. They pick up tools along the way to help them out and can work with their friends online to kill particularly persistent zombies. This game seems to seem somewhat like “World of Warcraft” in its multi-player role-playing atmosphere–with one big difference–the neighborhood is their neighborhood and the houses are their houses. Some of the teenagers begin to realize the dangers of the game, but most don’t notice or don’t acknowledge them. When the “game” is over, the audience has the same choice as the avatars: to either heed the warnings of the game or not to acknowledge them. The reality of this horror takes hold. 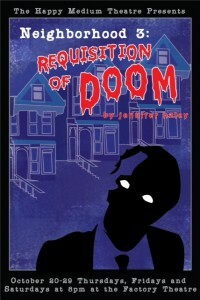 Neighborhood 3: Requisition of Doom is a projection of many family relationships torn apart by a lack of communication. So, go out now; see the show and talk with your friends and family before it’s too late. This entry was posted in Drama and tagged anger, Audrey Lynn Sylvia, ballet dancers, Barbara Digirolamo, communication, E Abigail Matzedder, family, Fear, Horror, isolation, Jennifer Daley, Lizette Marie Morris, lonliness, Michael Caminiti, Mikey DiLorento, mmorpg, neglect, Neighborhood 3, Neighborhood 3 Requisition of Doom, NH3, nightmare, parents, realistic, role playing, rpg, teenagers, Video Games, Violence by beccackidwell. Bookmark the permalink.